The Mitten Wife: MICHIGAN FALL MINI SESSION! AVAILABLE NOW! Would you LOVE photos of your family this fall? Have you been stalling on photos because of prices or timing? Need some new photographs for your holiday card? 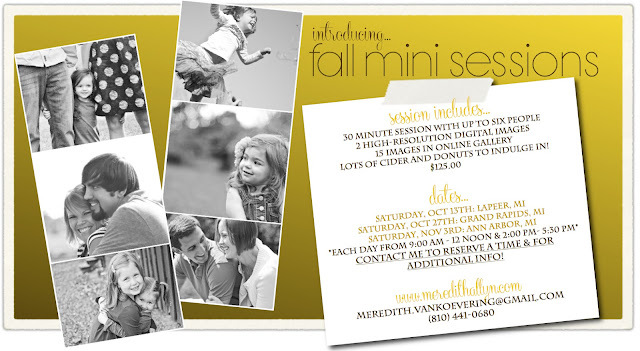 Now is the perfect opportunity to take advantage of a FALL MINI SESSION. I'll be doing mini sessions in THREE different cities in Michigan this Fall! *you'll receive detailed information with location & directions after you reserve a time slot. Most importantly, there will be LOTS of cider and donuts. from 2:00 pm - 5:00 pm each day. Contact me to reserve a time slot!